Photo by Jaz King on Unsplash. What are some of your top 5 iPhone apps? Facebook? Instagram? Twitter? Make sure GenderAvenger is up there. 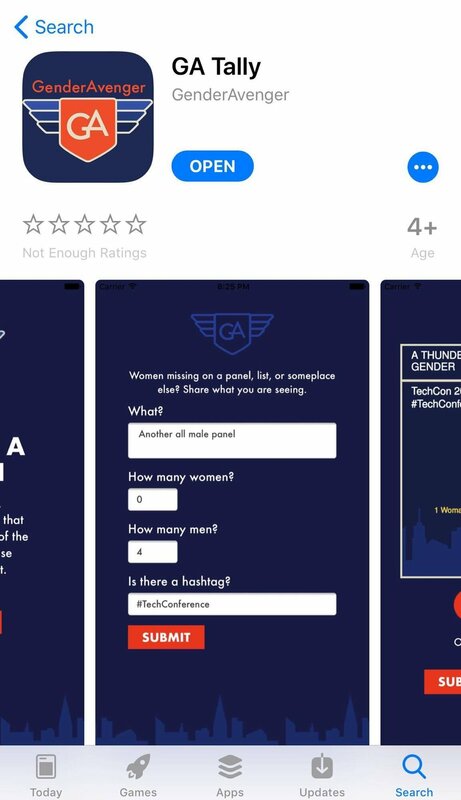 GenderAvenger, or better known as GA Tally, is an app that generates pie-chart graphics that illustrate how many men and women are represented in any known space. It's the easiest way to make a big statement about these issues on social media. It's simple, really. The app is found in the Apple App Store and it is free. Once downloaded, users place relevant information in the white boxes and the app generates a graphic based on their pre-programmed algorithm. While these graphics look fun, they're also important. According to a report by CNN in 2015, teens spend up to 9-hours a day on social media. An average person spends about 2-hours a day on social media. And online advertising revenue is radically increasing to nearly $36 billion this year as the necessity to be the loudest information on the web is also increasing. GenderAvenger is important because it's a visual way to present readily available information about gender inequality in a way that is visually pleasing and will rise above the rest of the endless stats available all over the web. Want to let your friends know women are 52% percent of moviegoers but only represented as leads 29% of the time? Make a bar chart. Want to show that as media budgets increase, female involvement decreases? Make a pie-chart. It's quick. It's easy. And it's sharp.